I bought my first slow cooker five years ago at Target. It was at the end of an aisle and on sale. That slow cooker lasted me five years, but I never loved it. I spent about $40 on it – it was a Crock-Pot and I speak of it in the past tense because it is gone. A few weeks ago, the ceramic insert broke in my hands and I rushed outside to the garbage can before my husband could suggest buying another insert for it. I was DONE with this Crock-Pot. The food tended to taste like the inside of a slow cooker. It sat on warm for too long and my food ended up dry. My dinner is a pile of mush! The issue with slow cookers is that they have been advertised as “set and forget” but that doesn’t actually work. A friend of mine who leaves the house at 8:00 AM and gets back at 6:30 – 10 1/2 hours out of the house – wanted to know if it could just turn off and not stay on warm. The problem is then you have a food safety issue if food sits at room temperature. That is why slow cookers never simply turn off when finished. My solution to this problem is to make sure that I am around when the cooking time is completed so my food doesn’t get ruined by sitting at “warm” for hours. I use my slow cooker more on the weekends. But, I wasn’t totally happy with the food. It wasn’t brilliant and it should have been because a slow cooker is simply a pot sitting over a low fire for hours. The flavors should deepen and tough cuts of meat should become tender if it works correctly – which it didn’t really. When my Crock-Pot broke it was good news because I could foray out into the world and find a new one. I have a copy of “Slow Cooker Revolution: Volume 2: The Easy-Prep Edition” and it is a pretty good book. I usually change the recipes to suit me because I find the food bland – but it has some beautiful pictures and good recipes. The book is by America’s Test Kitchen and it talks about all the slow cookers on the market – and they test them all. Their recommendation is the “Crock-Pot Programmable Touchscreen Slow Cooker, SCVT650-PS, 6.5 quart” and it costs $80. I decided to go for it because I have such hope for slow cooker meals. They should be awesome. Actually, all food should be awesome. Well, go and break your $40 slow cooker because this one is absolutely wonderful. I have turned out 5 or 6 meals and each one of them is better than the next. The meat becomes tender, the flavors meld, nothing gets burned or becomes mushy. It seems to hold the temperature much more consistently and the top doesn’t allow the juices out. Have you found success with new technology? Please share. Snack Girl bought this Crock-Pot with her own money. Crock-Pot did not sponsor this post (the company probably doesn’t know Snack Girl exists). I'm confused. You didn't like any of your slow cooker meals but you put them in your book? @Elisecas - Good question! I did recipes for the site and the book that worked in my $40 slow cooker. For the book, I created a chicken stew, beef stew, and split pea soup that all turned out great. But many recipes that I made have been less successful and consistent than with the new cooker - which makes consistently perfect meals. Lisa you aren't the snack girl that I once knew.. Now you are just out there pushing products for your own capital gain..
You are in no way pushing anything. I love you and found your review very helpful as I have been wanting to upgrade my 20 year old crock pot to a newer version but have found so many mixed reviews that I always just end up keeping the one I have. I trust your opinion. I love your honesty. Thank you for all your efforts. I love the last line: "Snack Girl bought this Crock-Pot with her own money. Crock-Pot did not sponsor this post (the company probably doesn’t know Snack Girl exists)." You crack me up! I love my slow cooker and mostly make pulled meats (Pork, chicken), soups and chilis, stews, and pot roast in mine. My last endeavor was a bag of bl/sl chicken breasts, cooked for 4 hours, drained the liquid, added 2 tubs of salsa, and let them tenderize and flavors meld. I shreded them with a fork and was a great go-to meal for the following days with different concoctions - quesadillas, tossed on salad, in a stir-fry, etc. I'd love to venture out more, though, and try some new things. Thanks for the recommendations! I recently purchased a KitchenAid Slow Cooker because it was recommended by America's Test Kitchen. It was expensive (over $100) but I've always had the problem of the cooker having hot spots. This one is the best I've ever used! I had a programmable Crock Pot like you show above, but ended up getting rid of it because of the hot spot problem. Good luck with yours! As a fan of America's Test Kitchen, I'm going go look at both the slow cooker, and the book. One problem I always have with the recipes is portion control. Often, the recipe gives nutritional info as something like 6-8 servings. I wish they'd say something like a serving is one cup. Otherwise, outside of removing everything, splitting it up into 6-8 servings, etc., how do ya know? 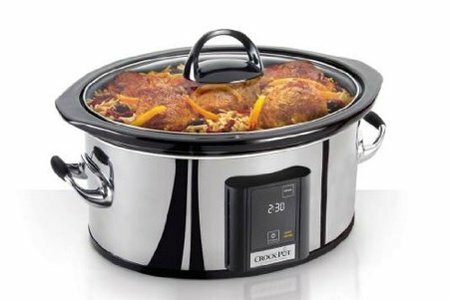 Crock pots are wonderful devices for keeping previously cooked foods warm on informal occasions.I borrow one when I need to use one but I do not own one.I must say they are wonderful for making soup. I suggest that you should save your coins for a nice enameled cast iron Dutch oven. You won't believe how versatile they are! Hmmm, like your idea of having the liner 'break' Snack Girl. Mine is 41 years old (gag)(wedding present)(how times have changed, but that is a differnt topic!) and I would like one that is more up to date and a bigger size and oval instead of tall! I love my Crock Pot. It's been amazing. 0 issues. It's digital and switches to 'warm' when done cooking. Every meal that comes out of it is fantastic. I live in Florida and my crock pot is a summer essential....delicious meals without heating up the kitchen. However, for me, $80-$100 is too expensive. I actually have two....a small oval and a large oval, both were much less expensive, and I have had no issues with either one. I love your Taco Tuesday recipe - it is a staple for me. It is very forgiving of anything else I add (mostly the wrong amount of salsa) and it freezes really well. What size crockpot do you recommend for two people? I have a large one and like it when making meals for a lot of people, but it does not work well for recipes for 2. I think, as with anything, it is personal preference. I have a $40 (maybe less) crockpot from Target and have had no issues. It has 3 options - high, low, and warm. Yes, if I am gone all day, my meat can dry out so I have to time when I start it but for the most part it is a "set it and forget it". I think how well done your meal gets depends on what you are making. As for "capital gain", anyone who knows anything about how Amazon Associates works should know that you will get literally pennies on the dollar for basically writing a review. If they don't like it, unsubscribe from the email list. Everyone is entitled to their own opinion.. So why jump all over me for my opinion..As far as Lisa apologizing I didn't ask for one. That's what I actually plan on doing taking the advice of Heather. Do you thinks this crockpot is good for two people? I thought a large crockpot would make food more dry because of cooking faster? Everyone is entitled to their opinion. So why jump all over me for my opinion on her endorsing products??? Her site is not like it use to be. She is just trying now to jump on the band wagon like Hungry Girl,which by the way I do enjoy. Snack Girl will never get to that position. I will take Heathers advice. I have a no-thrills crockpot too, just low, hi, warm and I don't have any issues with it. But my new love is my electric pressure cooker from Instant Pot. Besides, PC, it's a slow cooker and yogurt maker. AND it has a stainless steel insert not non-stick, which is what sold me. I still use my crock pot once every 1-2 weeks, but I use the IP probably 3-4 times a week. I ordered this crockpot this morning based on Lisa's review/comments. I too have an older model crockpot that gets terribly hot in one spot and usually burns the grits that I cook in it in that one spot. Then not only are they burned, they're really difficult to get off even after soaking. So I'm looking forward to a new model. I've been hoping to find one that someone else recommended. Guess what? This is the recommendation I believe and trust. Thanks, Lisa! I'll let you know (in a future post) how it works for me. I have this same slow cooker and LOVE it. One thing about it that is quirky... the handles are not covered completely, so you need to remember the metal part of the handles are going to be hot. Not to worry though, you'll only do that once, LOL! But it really is an excellent slow cooker, glad I have it, and I do love it a lot. I love m crockpot and use it all of the time. I just made soup today! Debbie, I have been looking at pressure cookers for a few months now wondering if they are as great as they seem to look to be. It seems that I could get rid of my rice cooker and crockpot if I got one of these. Thanks for the info. My first slow cooker was an anniversary gift from my mother 40 years ago. I waited until all my children were in school and then I went to college. Couldn't have survived without it all those years ago, because still had a meal ready every night. I still have that original slow cooker, but have added others over the years. Now that it is just two of us, but I am still working, I use a small one most often. Thank you for any slow cooker recipes you share.